← HR: How Disconnected Are You From Employees? 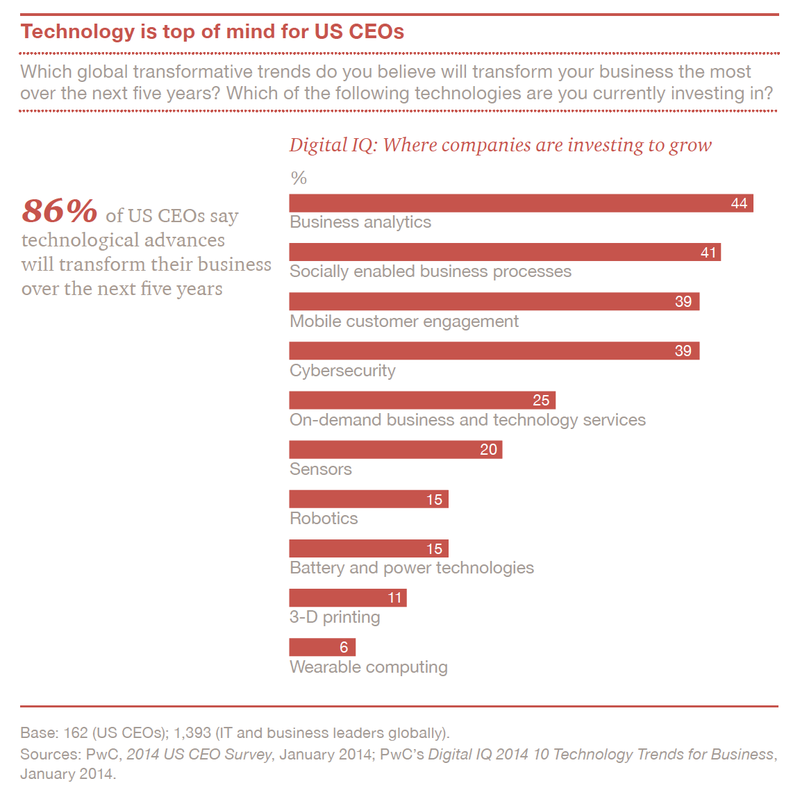 PWC’s 17th annual global CEO report “Good to Grow: 2014 US CEO Survey”, provides a thorough snapshot of executive leadership perspectives and approaches at the current moment. PWC’s report includes perspectives from over 1,300 CEOs from 68 countries, including 162 CEOs with US-headquartered organizations. It’s clear from the responses that, globally, CEOs are making many changes within their organizations. For example, 86% of CEOs stated that advancing technologies are going to transform their businesses over the next five years. Positively, PWC’s data also suggests that CEOs are finding reasons to be more confident in many places (89% of US CEOs are fairly sure their companies will deliver revenue growth this year). In this period of rapid change though, what approaches are CEOs taking, and what insights can they offer? Technology is making an impact across the whole enterprise. CEOs are seeking new ways to work together in joint ventures and alliances to capture disruptive technologies faster. In some cases, the business model is being innovated. There are rising concerns about talent. As organizations undeniably shift into a period of growth (62% expect to hire more people this year, the highest level of anticipated headcount expansion in the past five years for this survey), how do these five great forces of transformation come into play? All CEOs seem to agree, that technology is what propels business, and will continue to do so. PWC states that, in part, “Technology” is a watchword for 2014 because CEOs use it when talking about both core innovation and information technology (IT). Technology has become an essential part of strategy in all areas – for organizations pursuing new business models, meeting new customer expectations, remaking their operating model, forging new alliances, or tackling talent challenges. CEOs are reshaping business models though innovation. They are taking cues from the technology industry that has paved the way by creating value for customers in a multitude of new ways. Organizations are looking to create increased profit for what they offer beyond step-by-step product innovation, and they are stepping out of the box to innovate in ways such as turning a product into a service, or vice versa. New approaches to innovation and R&D are part of an increased strategy by many US CEOs in 2014. For example, some organizations report funding innovation incubators to foster rapid prototyping of new ideas, while others report wanting to join up with emerging market innovators who are developing low-cost products. 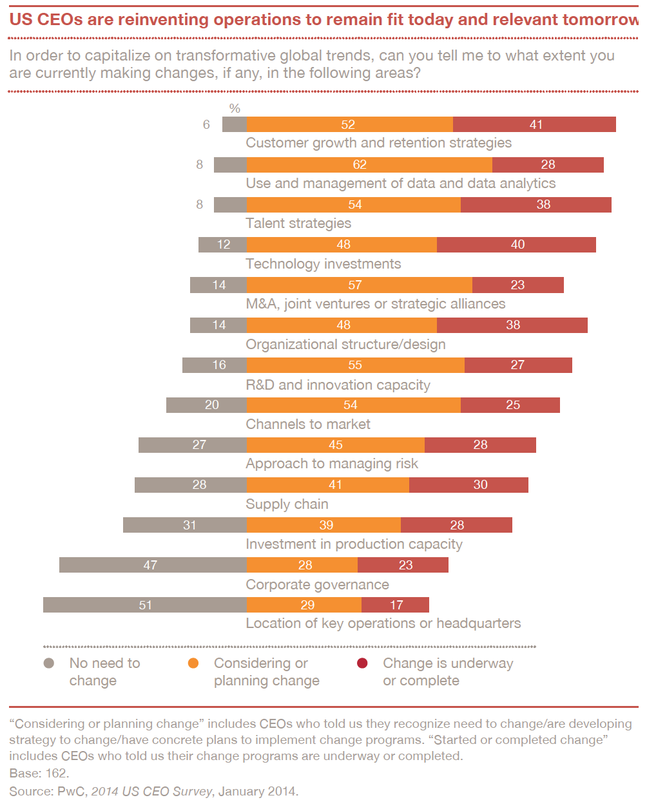 PWC’s survey also indicates that customer strategies will get a serious makeover in 2014, with 52% of CEOs reporting that they are planning to change their customer growth and retention strategies. As creating a positive and personal customer experience only continues to increase in value (and as a standard of expectation) more organizations will see CEOs leading them toward a strategy of customer interaction. This will move away from stand-alone transactions to a sustainable “always on” relationship with customers. While CEOs plan out such new strategies, they are also discovering that most current capabilities are “fair game for reinvention.” The vast majority of CEOs are already debuting a fair number of change initiatives with a focus on moving away from rigid structures towards more nimble, adaptable operations. Business alliances and joint ventures also appear as a CEO noted trend for 2014 – within the U.S. and globally. 42% of CEOs surveyed report that they plan to enter a business alliance/joint venture this year while only 4% expect they’ll exit an existing relationship. CEOs are also looking at acquisitions, with 39% of US CEOs planning to complete a domestic acquisition in 2014 and 28% planning on a cross-border deal. A last trend to note from this survey is in regards to talent. I’ve talked about the talent acquisition “crisis” or “war on talent” in past posts, and unfortunately, PWC’s CEO survey does nothing to dispel this issue. 70% of US business leaders report being concerned about the availability of key skills. This compares to 54% that said so in 2013.